Download our app, sign up and upload your resume. Based on your skills, interests, and experience, our artificial intelligence engine will frame the questions most likely you will be asked by the interviewer. We are happy to gift you with five mock interview session so that you can check out our system and prepare for your interview day. Click Start the Interview button to start the mock interview session. We are happy to gift you with five free mock interview session so that you can check out our system and prepare for your interview day. Click Start the Interview button to start the mock interview session. The app will show you the correct answer and your score at the end of every question you have answered. Once you complete the mock interview, you will be able to see your score, your answer, and you will be able to analyse your readiness. We don’t record your audio and we don’t attach your personal identity when we store the text response of answers. Our intelligent interviewing engine works based on the most modern technology using Natural Language Processing, Artificial Intelligence, and Machine Learning. 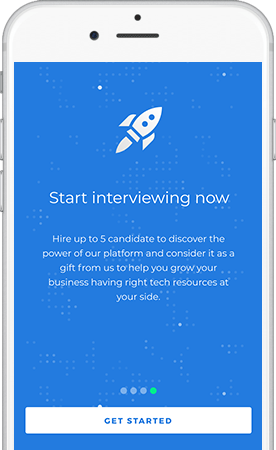 Our team works tirelessly to build a most credible mock interviewing platform with the aim to help you excel in the career life!